When I set out to find a place to host the Craft Beer Debates, one of the locations that came to mind was Slater’s 50/50 in Liberty Station. I’d first been there, drawn by the siren song of a half bacon burger, early in 2012. What I realized was that the restaurant had an enormous list of local beers and an army of friendly bartenders. Because Slater’s seemed pretty active in a recent political race, the Craft Beer Debates seemed like a natural fit. Scott Slater is a 30-year-old San Diego State graduate with a passion for comfort food and a commitment to craft beer. Slater started his career in 2003 by owning a food cart business outside of Home Depot stores across the country. When the economy burst, Slater sold off his part of the business and decided to open his next venture, Slater’s 50/50 Burgers by Design. 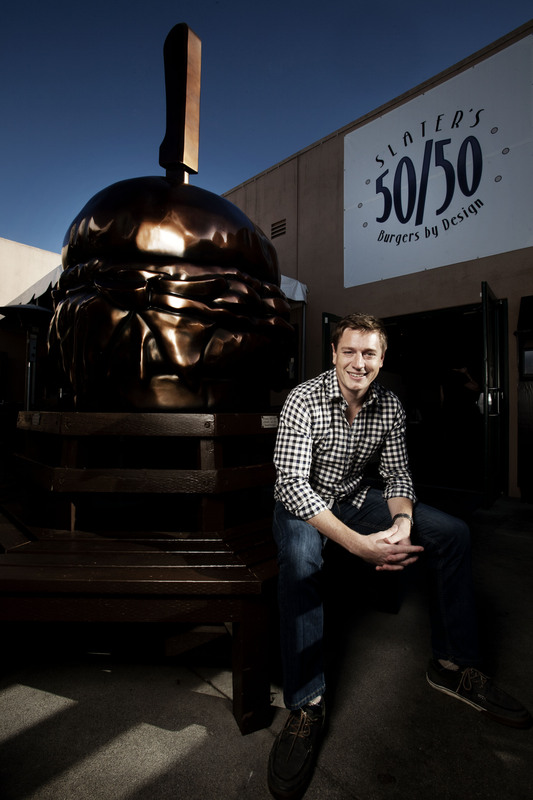 How it all began: On a dare at a Charger’s tailgate party, Slater and some of his college buddies made an all-bacon burger that was the inspiration for what would eventually become the restaurant’s signature 50/50 burger. It’s been three years since the first Slater’s 50/50 opened in Anaheim Hills in 2009 and has since expanded to Huntington Beach and San Diego. Slater’s 50/50 will continue to expand in the Southern California market while staying true to Slater’s strong community ties, fresh high-quality food and a great atmosphere. Given how this all began, Slater’s 50/50 seems like the perfect place for our first debate about the future of the Chargers stadium. Remember to check back on September 12th for the live Internet link. You can drop in to your favorite pub, grab a craft beer and watch the debate live from your phone, iPad or laptop. Read What are the Craft Beer Debates for a quick background. Sign up to come out and have some fun here// . Cheers!